Kentucky Army Guardsmen Pfc. Kara Denise Bucklew and Spc. 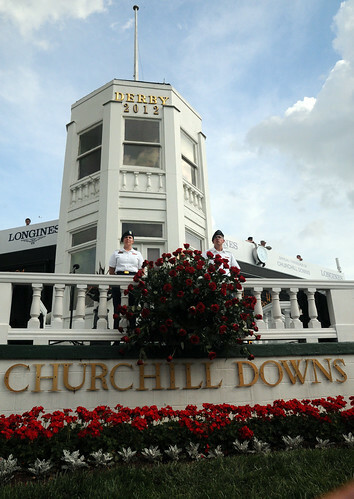 Eddy D. Mitchell, both MPs with the 223rd Military Police Company stationed in Louisville, Ky., guard the winner’s trophy in front of the winner’s circle at Churchill Downs in Louisville, Ky. May 5 2012. This year marks the 138th running of the roses and was Bucklew’s first Derby experience. (Photo by: Spc. 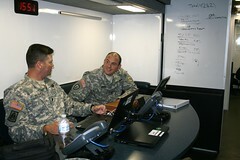 David Bolton, Public Affairs Specialist, 133rd Mobile Public Affairs Detachment, Kentucky Army National Guard). Louisville, KY. (May 8, 2012) – The 138th “Run for the Roses” was one that was on track to set new attendance records. The previous attendance record, which was set in 2011 was 164,858 spectators. This year that number was surpassed by nearly 500, with 165,307 in attendance. The record attendance also generated a record number of wagers. A total of $187 million dollars was bet on the full 13-race card. 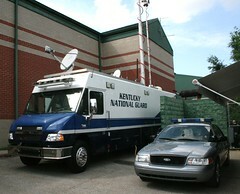 The operations center for the Kentucky National Guard works in concert with local law enforcement and emergency personnel to ensure the safety and the smooth operation for the entire Churchill Downs premises.